Guess whose belly was full and whose udder was empty when I showed up with milking gear in hand Tuesday morning? I guess Abigail's finally going to let me off nursing duty so I can start enjoying this speedy transition from January-in-February to April-in-March. Yes, the first speedwell and bittercress are starting to bloom, the frogs are starting to call, and it's time to get serious about the gallons of sap coming out of the one tree we've tapped on this side of the still-flooded creek! My movie-star neighbor had big plans about expanding his sugar mapling operation this year, and I have to admit his enthusiasm was contagious. After all, tapping maples seems to be much simpler and more dependable than getting honey from chemical-free bees. 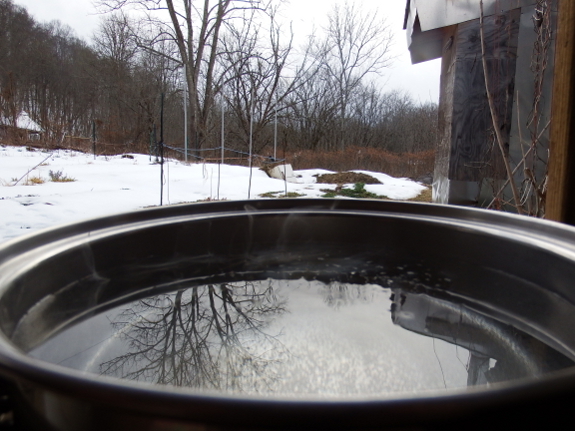 The kink in the maple syrupping plan, though, is boiling down all that sap. The weather is already getting too warm to drive off the moisture from a single tree's sap on our wood stove, and using the electric stove seems very inefficient. But what about the rocket stove? I filled a big pot with box-elder sap on Monday night and decided to give the system a test run. 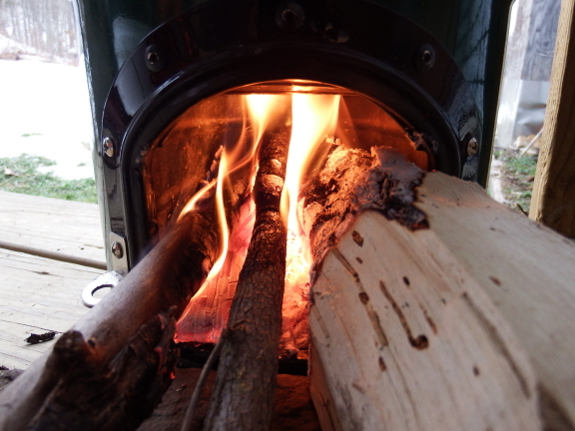 The good news is, one hour of rocket-stove use only consumed about half again as much wood as is pictured above. The bad news is, the flames only drove off about a cup or so of water, the sap ended up getting a bit ashy, and I learned that you really do have to tweak the fuel in a rocket stove every five minutes or it'll burn down to coals. So, no rocket-stove maple syrup for us. I guess we'll stick to syruping on a small scale until a better way to boil down the sap appears out of the ether. Maybe we need to make a self-feeding rocket-stove-fuel hopper? For my small scale operation I just make a fire pit in the yard using cinder blocks with the commercial buffet table trays above them. Then build a regular fire under them and boil all day, feeding the fire every hour or two. I was planning on using the rocket stove to pre-warm the sap before i add it to what is already boiling. I can keep a lid on the pot for that and hopefully avoid the ash problem....my biggest concern will be how to pour out those trays of boiling syrup into the finishing pot? But no matter how you look at it, evaporating water takes a lot of energy. So you need to maximize the heat flow from the fire into the water. You've already taken the first step by using a flat and shallow pan. That gives a lot of surface area for both evaporation and heating. A possible improvement is to put a lid on the pan and use a vacuum pump to put the whole thing under vacuum. This will depress the boiling point of the solution and thus improves the heat flow from the fire to the liquid. Another possibility is to heat the sap and pump it through a shower head or another kind of sprayer and then catch the droplets and return them to the heater. That would also help the water evaporate. Alternatively you could pump air through the hot solution like in e.g. a bubble bath. With regard to rocket stoves, rocket mass heaters usually have a horizontal burn chamber with a vertical fuel reservoir where the sticks are standing up. That way gravity feeds the wood into the fire. Such a design would probably solve your fuel feed problems. That last picture cracks me up. That is a satisfied baby! Is the issue with using the wood stove simply that you don't want to heat up the whole house, or is it something to do with the properties of sap/syrup that you need a different heat source when the air is warmer? Yay! Isn't that just the sweetest feeling that all is right with mama and baby? Phew. Glad everything is falling into place. You could also dig an in-ground rocket stove if you could find a spot that wouldn't hit ground water, but ours still seems to require tending every 10-15 minutes. Hope these get the gears turning! There are some designs out there for a batch feed rocket. You might be able to make a reasonable one that works work for this year with some bricks and mud.